Man with a hatchet and pellet gun unleashed a volley of pepper spray at audience members inside a movie theater Wednesday before being shot dead by a SWAT team. 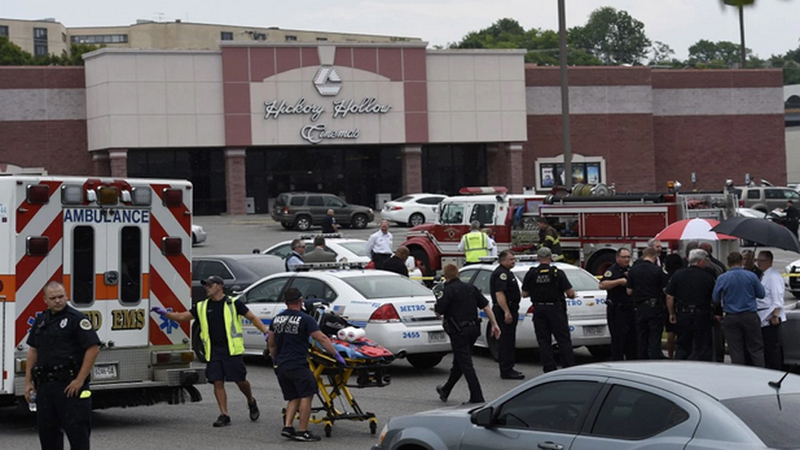 The attacker, identified as Vincente David Montano, 29, of Nashville, was carrying two backpacks, one of which hung from his chest, and he wore a surgical mask, possibly to protect himself from the pepper spray he unleashed in large amounts during the showing of “Mad Max: Fury Road,” Metro Nashville Police spokesman Don Aaron said. He said three people were blasted with the spray and treated. There were eight people in the theater, including Montano, Aaron said. As Montano fled out the back of the theater Wednesday, he encountered a SWAT team and was shot dead, Aaron said. Aaron said police had not uncovered a motive, but he said Montano had been committed for psychiatric treatment at least four times, twice in 2004 and twice in 2007. He also noted that Montano had been arrested in Murfreesboro, TN in 2004 for assault and resisting arrest, and said he was reported as a missing person to the Murfreesboro police department on Monday.